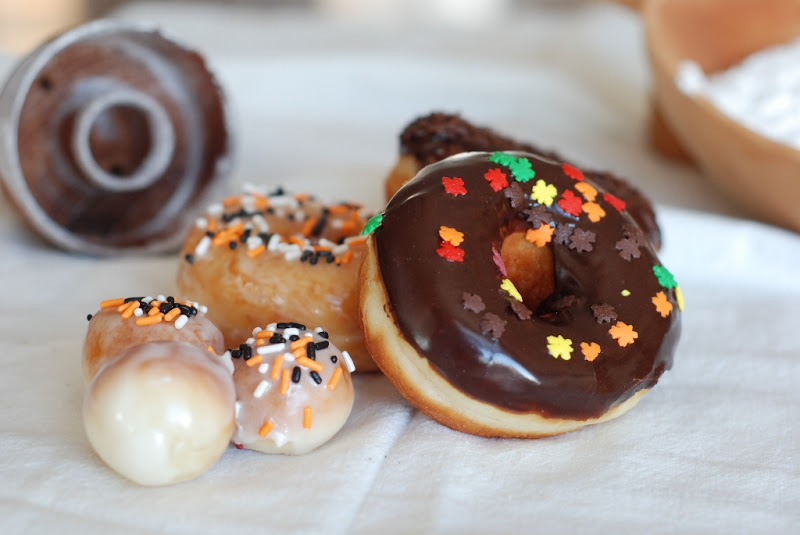 Raised potato donuts or Spudnuts are soft and airy donuts are made by adding mashed potatoes, which makes a soft and tender dough. 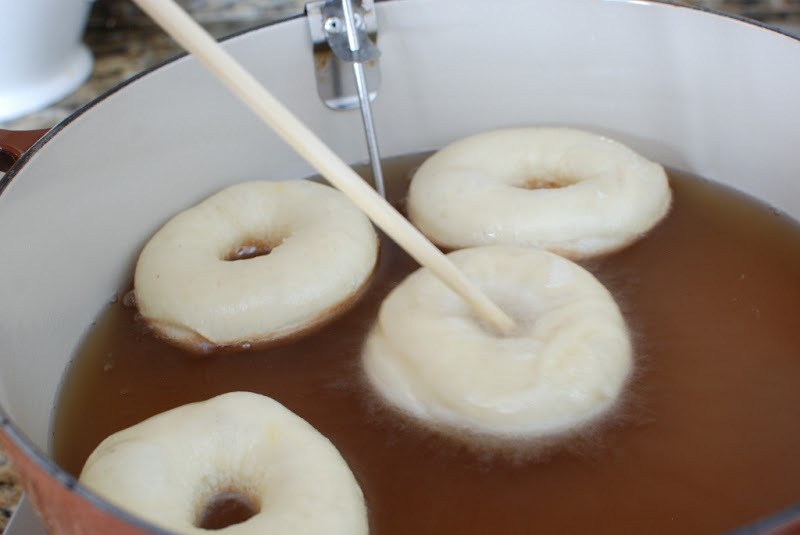 Many, MANY years ago I found a recipe in my local newspaper for Raised Potato Doughnut or Spudnuts. The recipe was published around Halloween. The recipe clearly stated that it made 100 doughnuts. 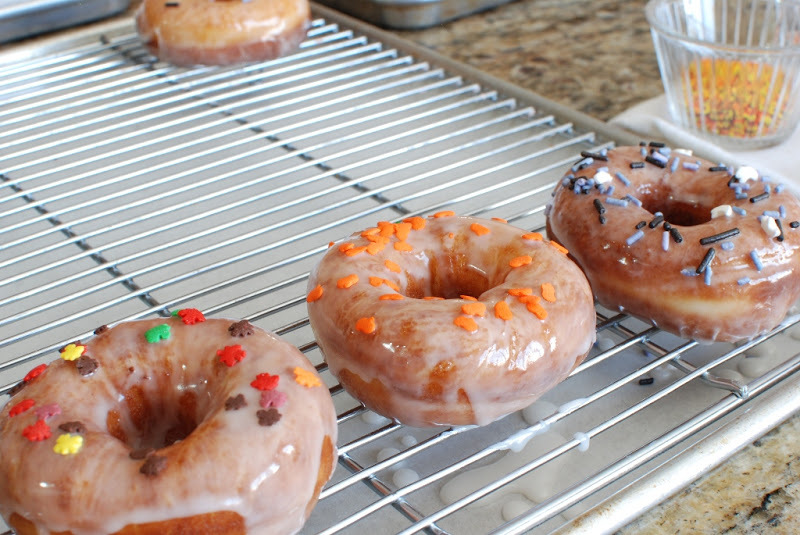 Do you know that the recipe actually DID make 100 doughnuts along with 100 of their little holes? I was plating up doughnuts as fast as I could fry them to give to my neighbors. I have reduced the recipe considerably, but it will still make about 40 soft and wonderful donuts. 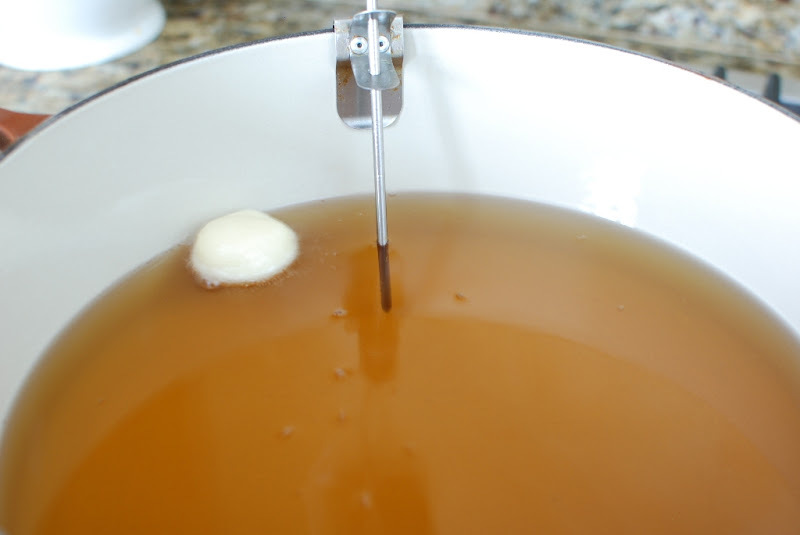 Add the yeast to 1/2 cup warm water. Stir to dissolve then set aside. 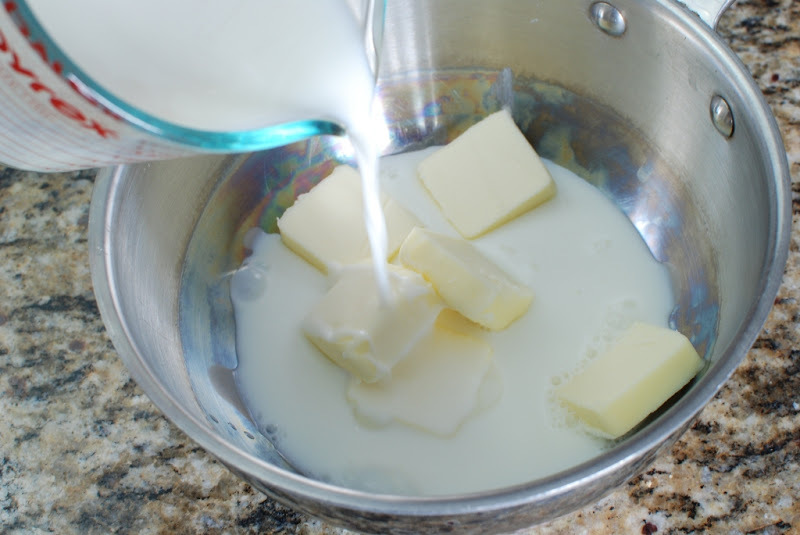 In a sauce pan, add butter and milk. Add the mashed potatoes. This is why they are called Spudnuts or Raised Potato Doughnuts. Stir the mixture. The butter will begin to melt, but probably not completely. Heat mixture until it is very warm. 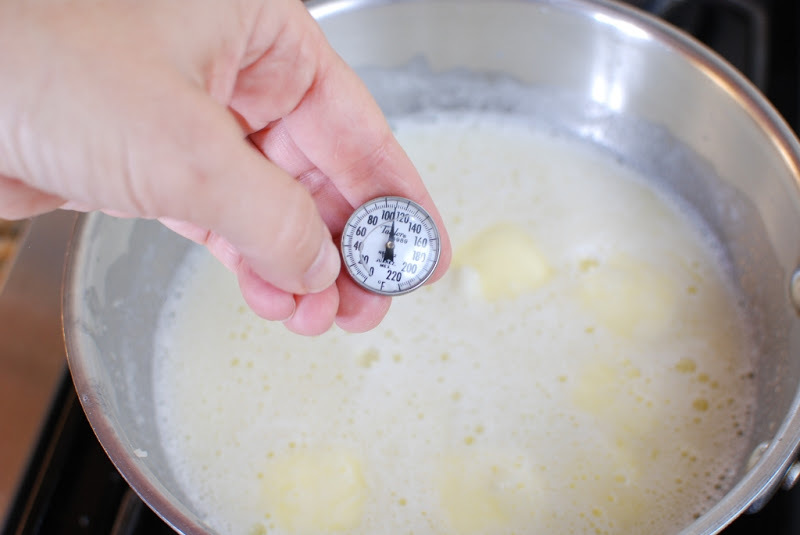 If you have an instant read thermometer, put it into the mixture and heat until it reaches 110-115 degrees. Remove from the heat. 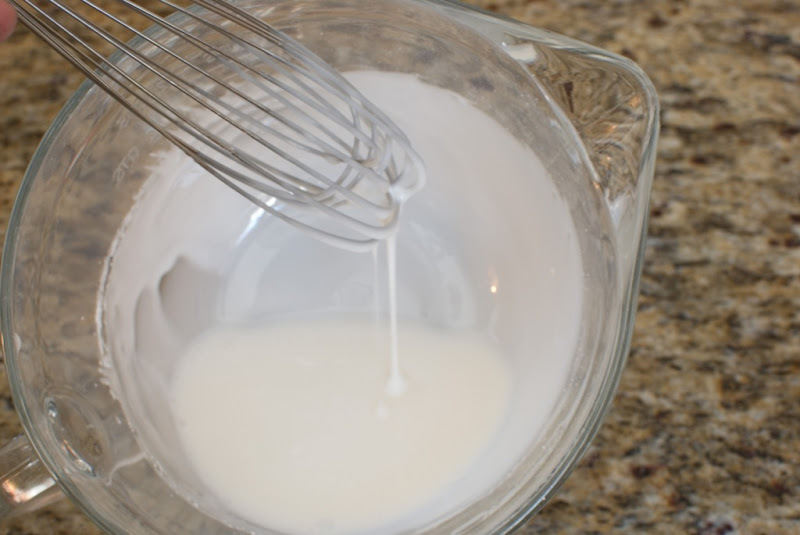 Pour the warm mixture into the bowl of an electric mixer. Pour into the warm mixture. 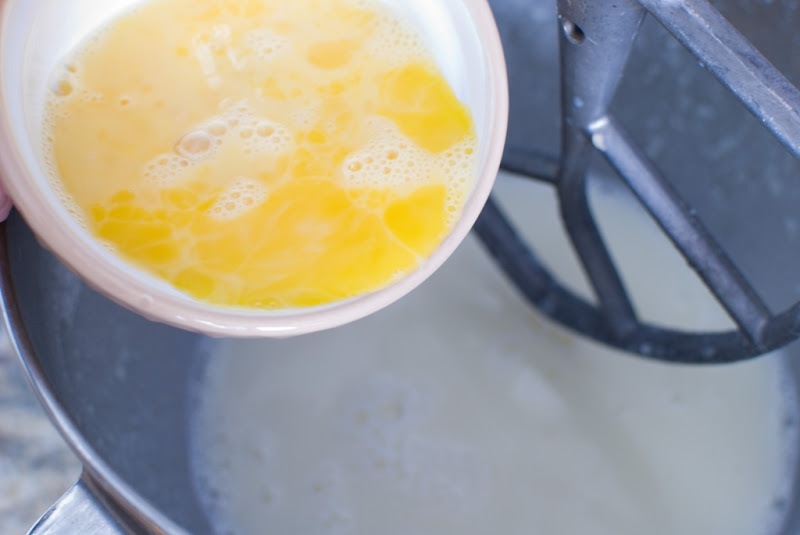 If the milk mixture is too hot, it will cook your eggs. You don’t want that to happen. 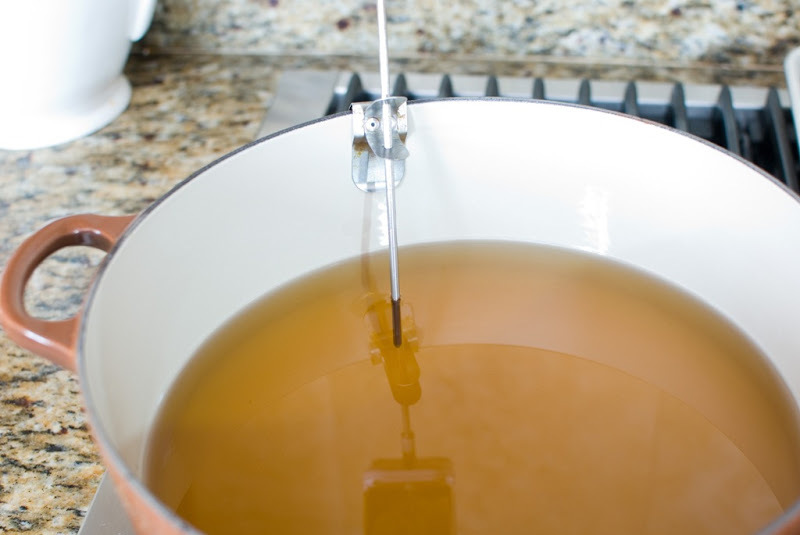 Add the reserved, dissolved yeast. 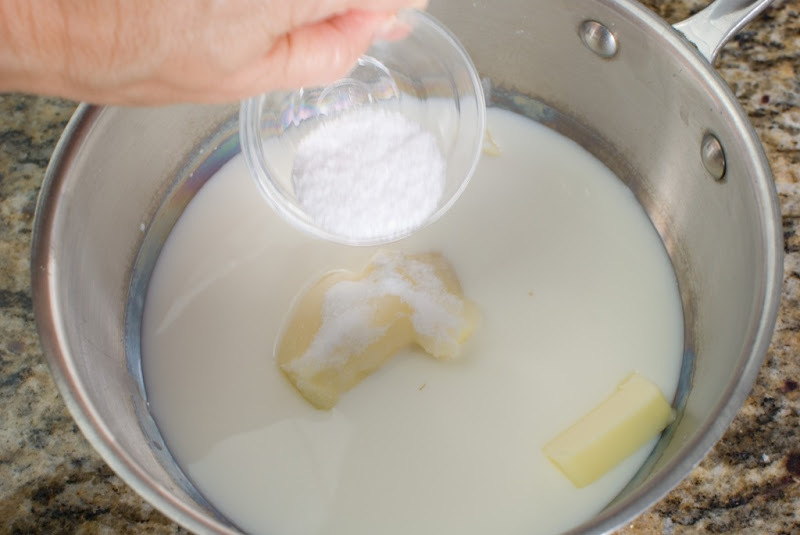 Add 3 cups of flour and mix until smooth. 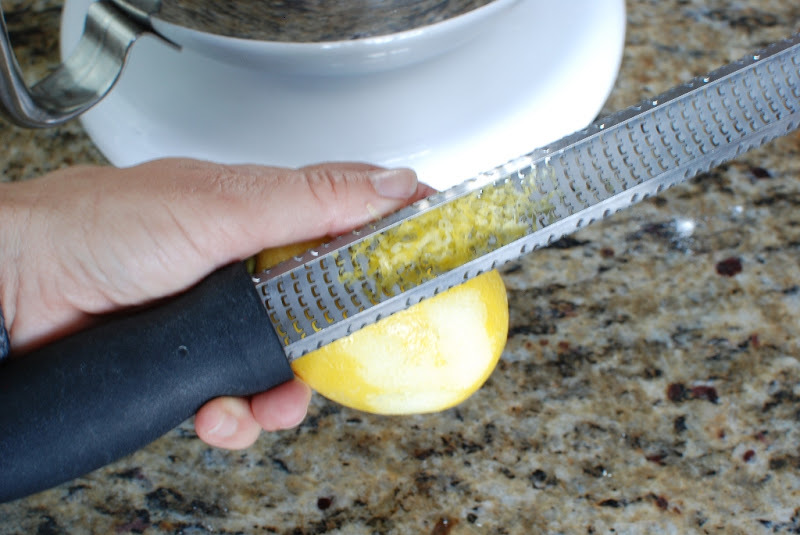 Squeeze in lemon juice. You can measure if you want. I just give it a squeeze. I hope you have whole nutmeg. 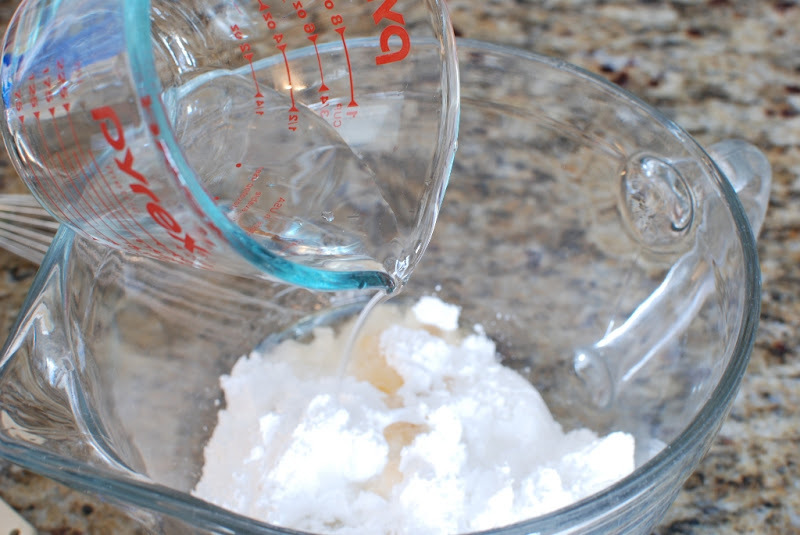 If you do grate 1/4 teaspoon into your dough. 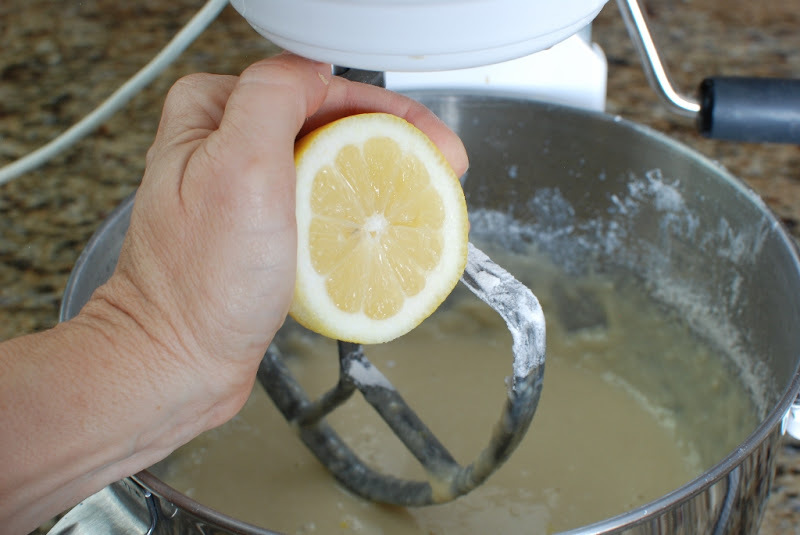 Mix in the lemon zest, juice and nutmeg. Add remaining dough 1 cup at a time. Mix well after each addition. 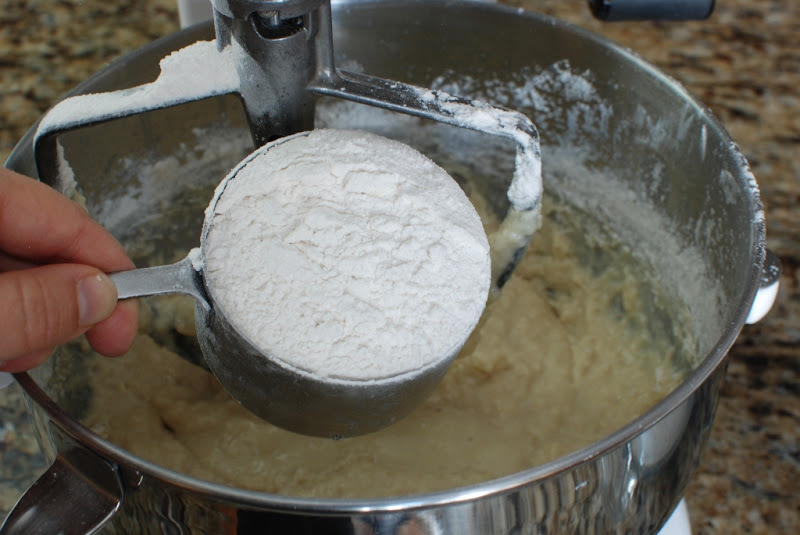 Add flour just until the dough pulls away from the sides of the bowl. I used 6 1/2 cups on this batch dough. You may need more or you may need less. 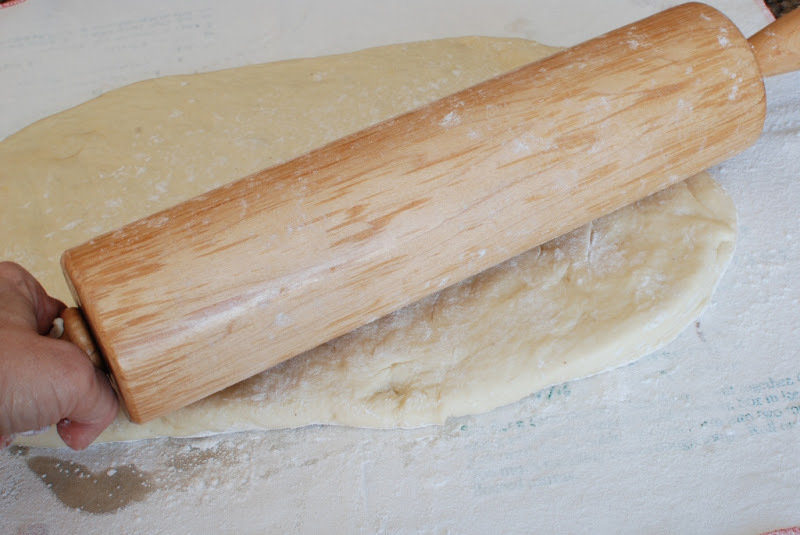 Just follow the consistency of your dough more than the amount the recipe calls for. 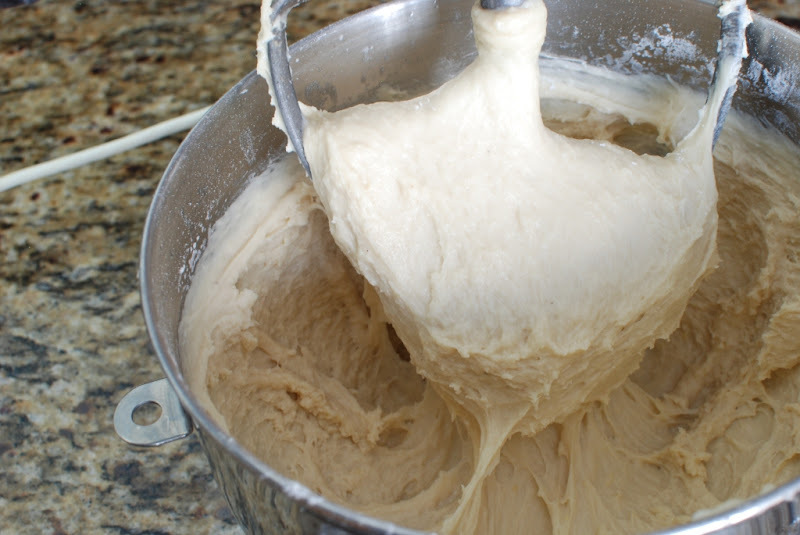 The dough should look like this. It’s just a bit sticky. Not much. 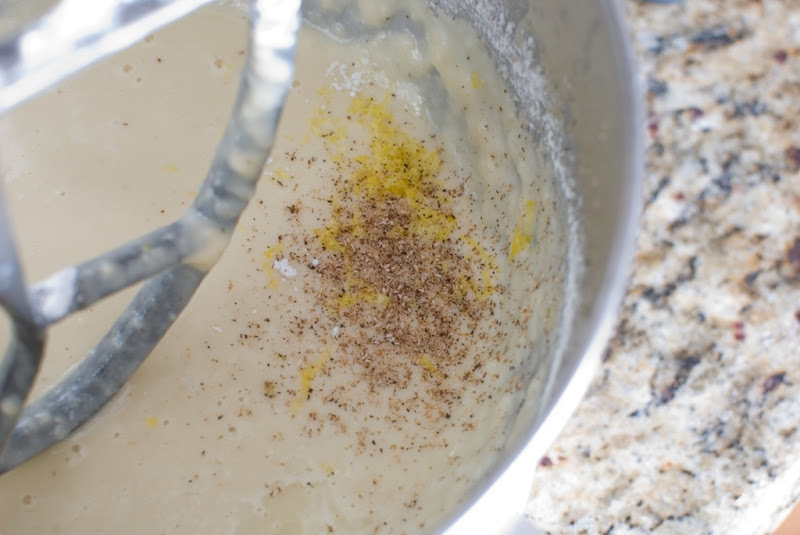 You will notice that the addition of potatoes will make the dough very smooth and oh so nice. Lightly oil a very large bowl. 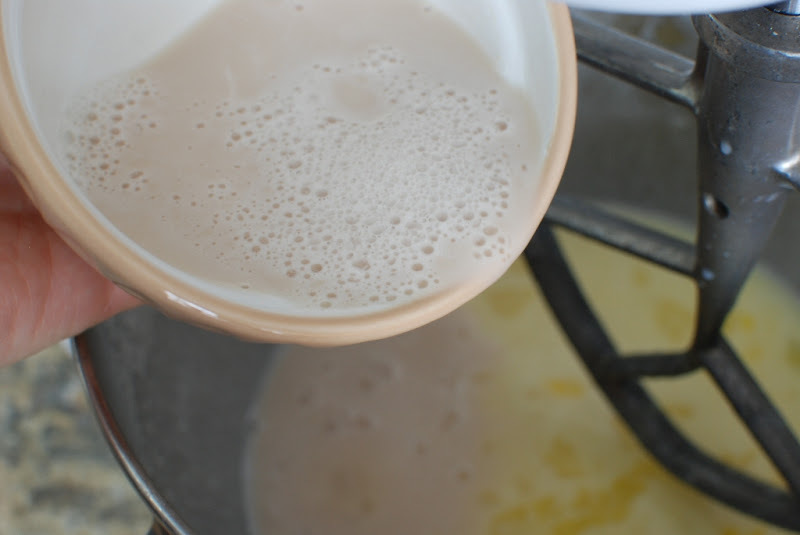 Transfer the dough to the large oiled bowl. Turn the dough over so the dough is oiled on all sides. 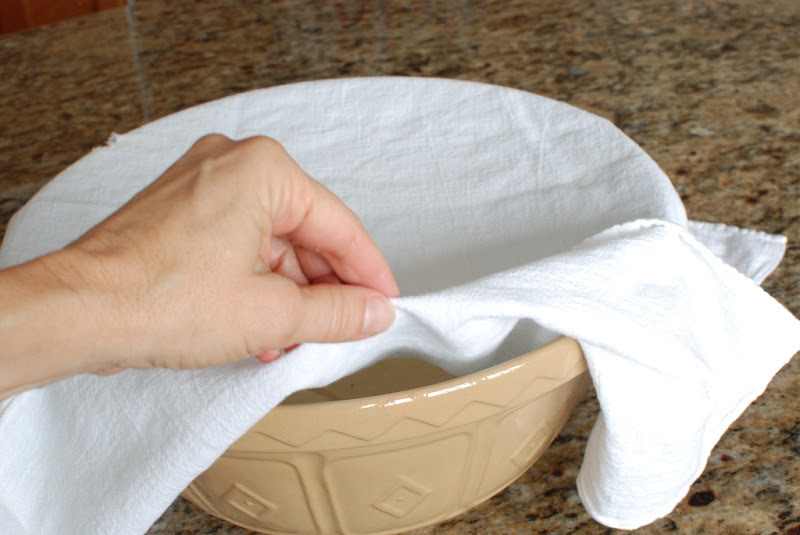 Cover the bowl with a clean dry cloth. 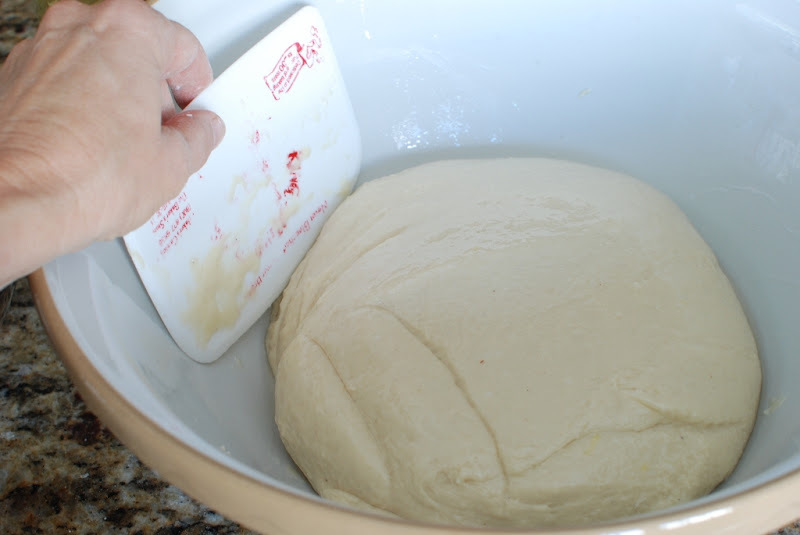 Set aside and allow the dough to rise until doubled in size. This could take 1-2 hours depending upon the temperature in your home. This is what the dough should look like once it has risen for a couple of hours. Go ahead and punch it down. 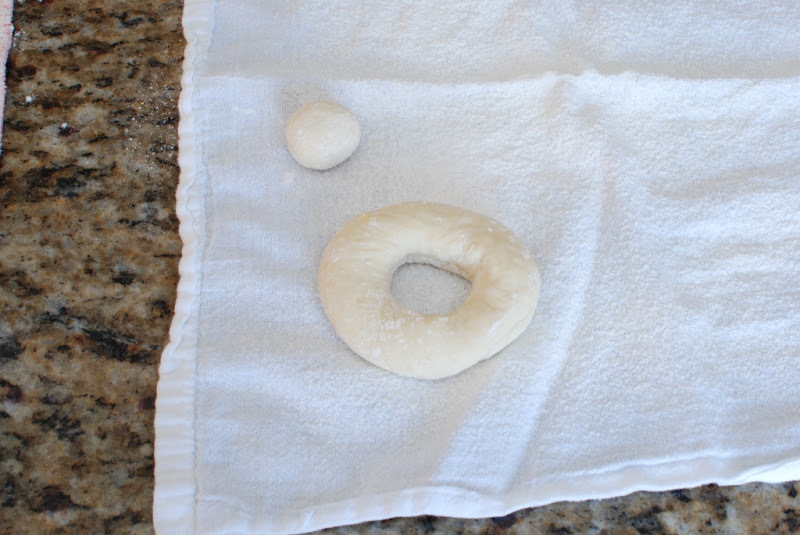 Before rolling out the dough I like to prep a clean dish towel to put the doughnuts on. 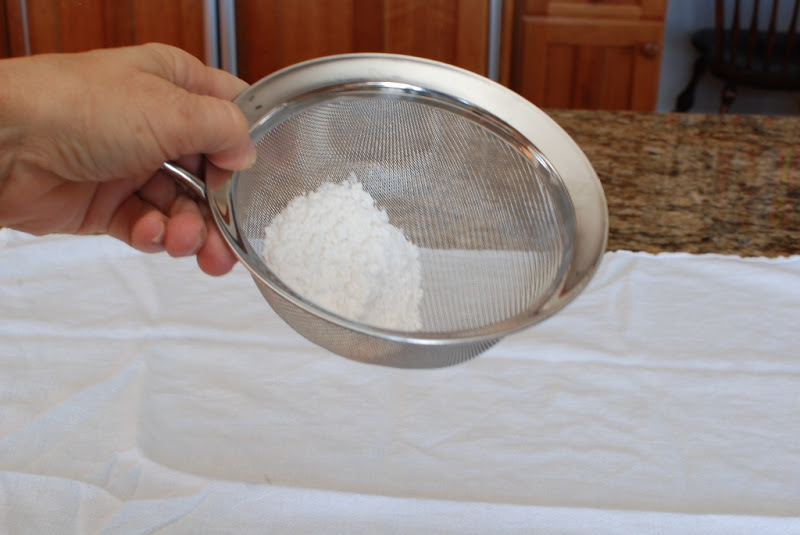 I just sprinkle about 1/3 cup flour over a dish towel. Set aside. I like to divide the dough in half and work with half at a time. 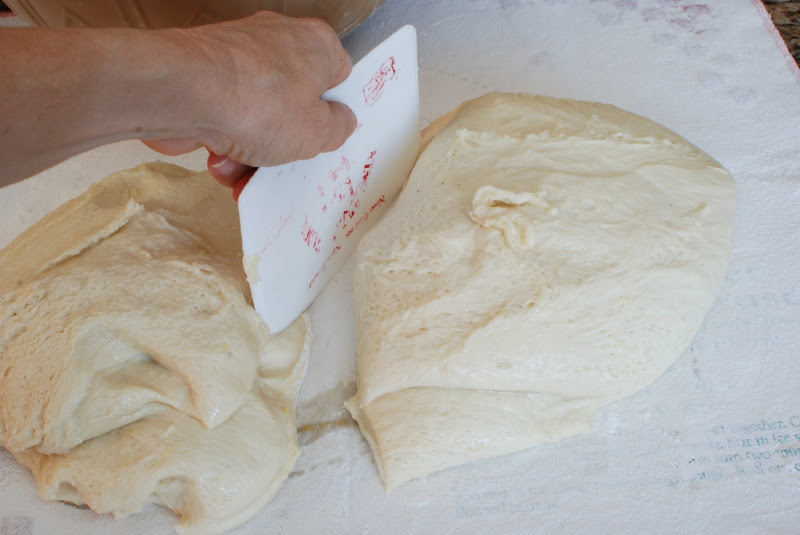 The dough is soft enough that you can gently pull into a rectangle. 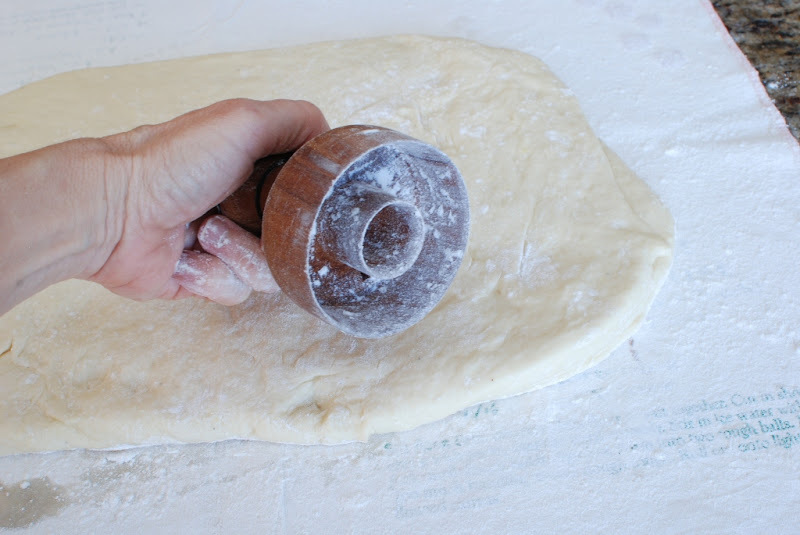 Roll the dough out until it is about 1/2-inch thick. 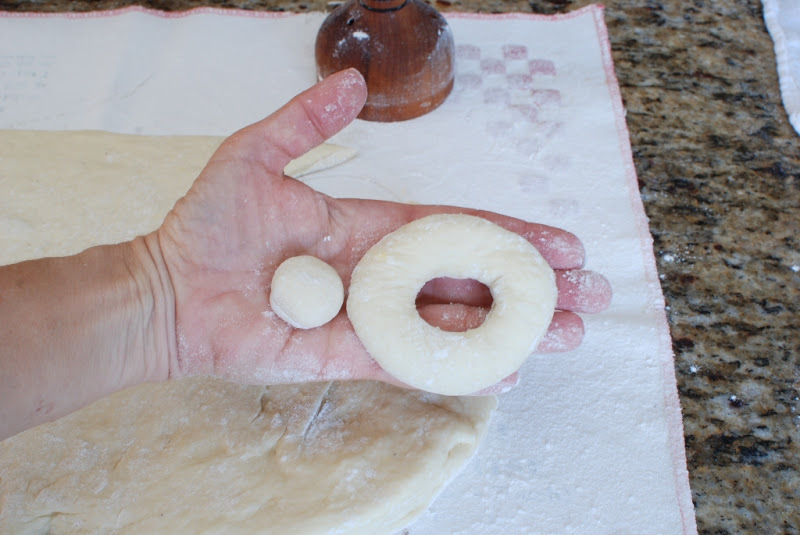 Flour a doughnut cutter. I found this dandy wood cutter somewhere in Vermont several years ago. So cute. Oh how I love Vermont. 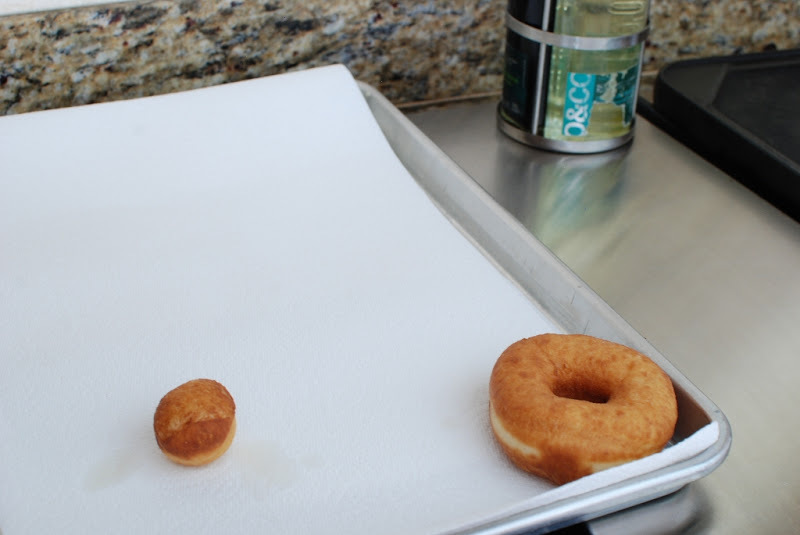 Place the doughnut and the doughnut hole onto the prepared dish towel. 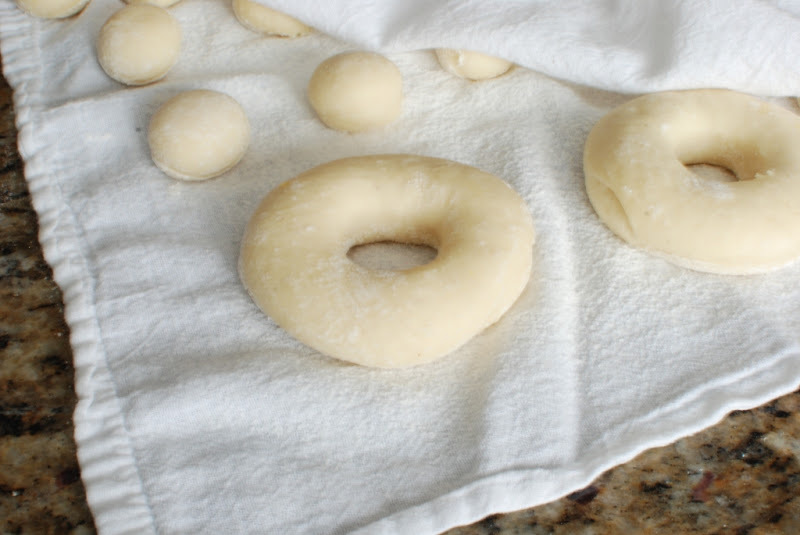 Now cover the rolled out, cut doughnuts with another dish towel. 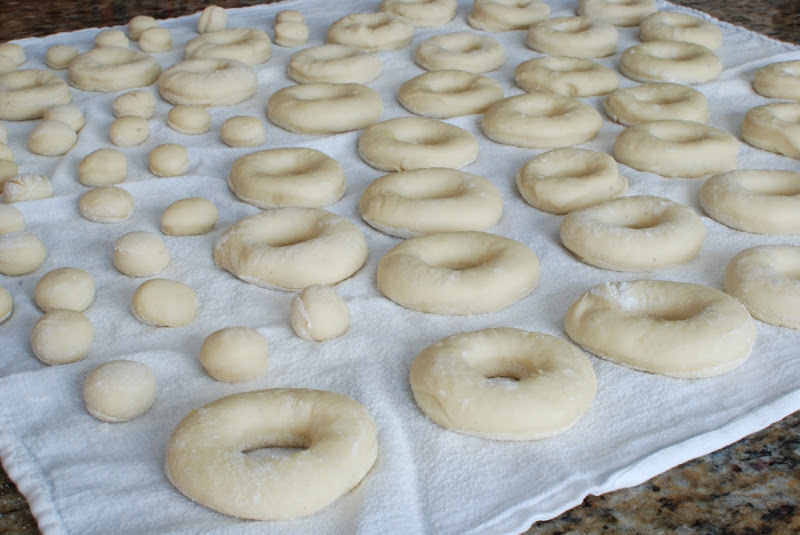 Allow the doughnuts to rise for about 30-40 minutes. This is a good time to clean up the kitchen and to prepare the glazes. 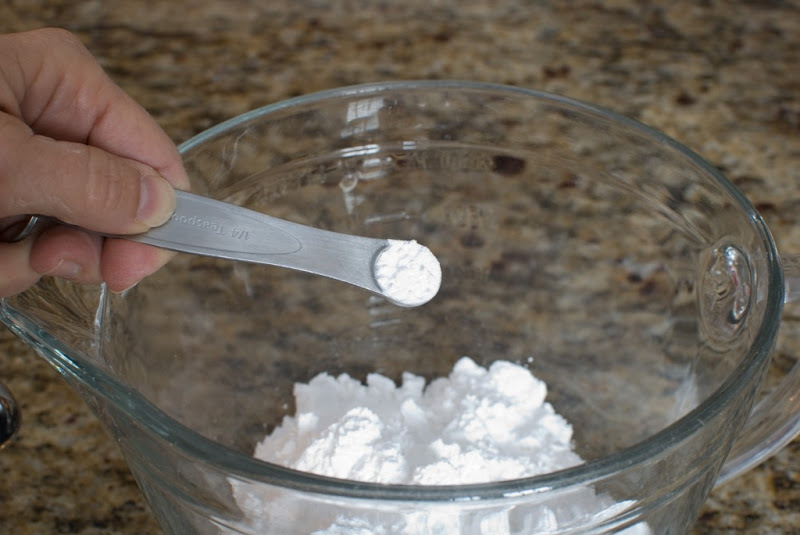 Add the confectioners sugar and cream of tartar to a medium size mixing bowl. 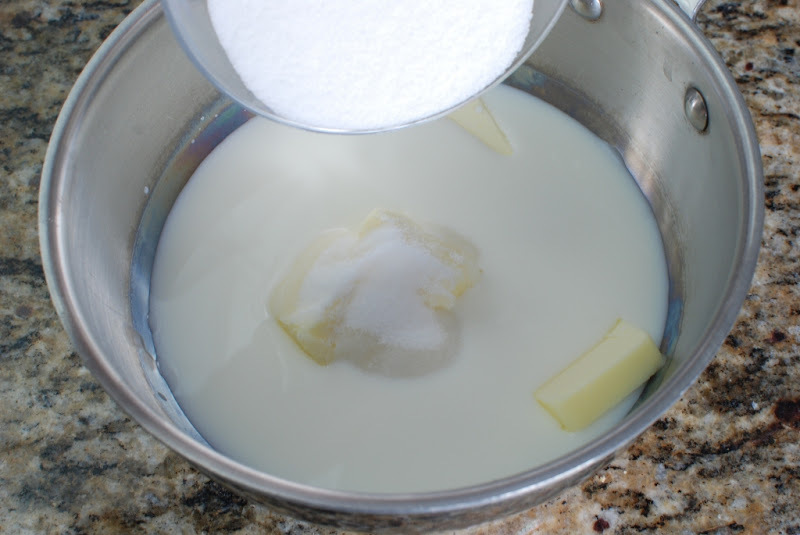 Mix well until there are no lumps and the glaze is smooth. The glaze will be quite thin. 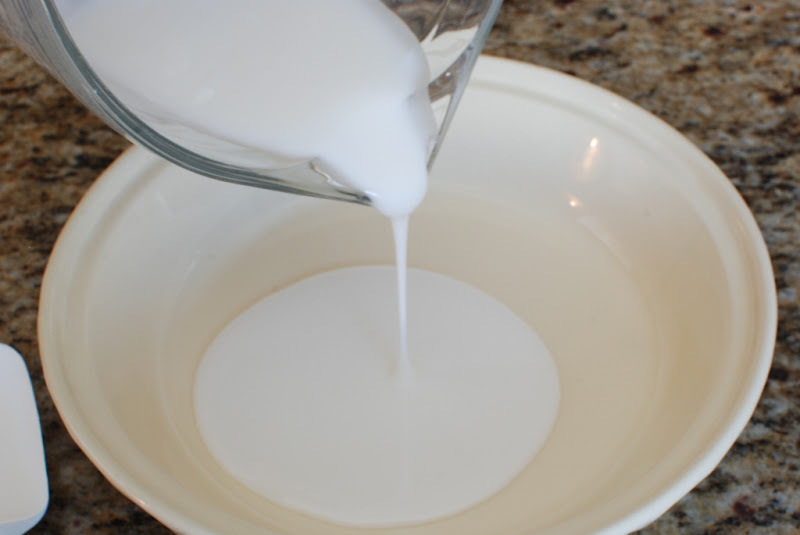 I like to pour the glaze into a shallow dish. 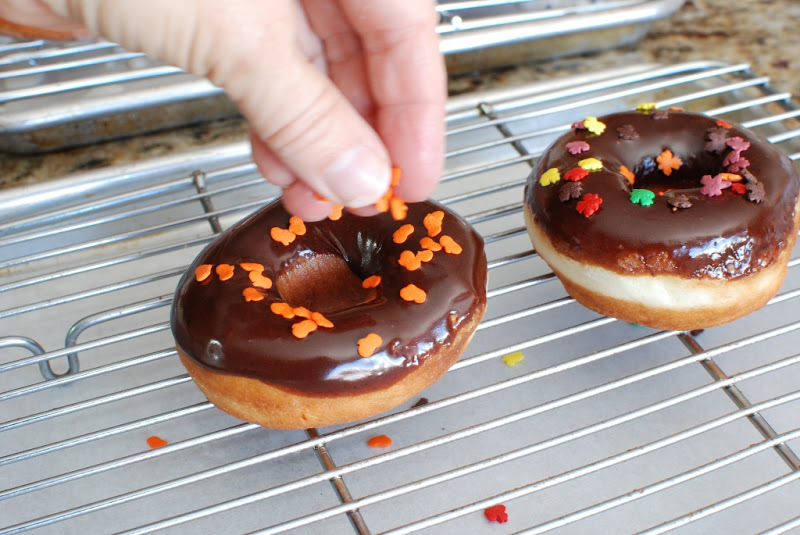 It is just easier to dip the doughnuts in. Cover with plastic wrap because a thin crust will form on the top if your don’t. 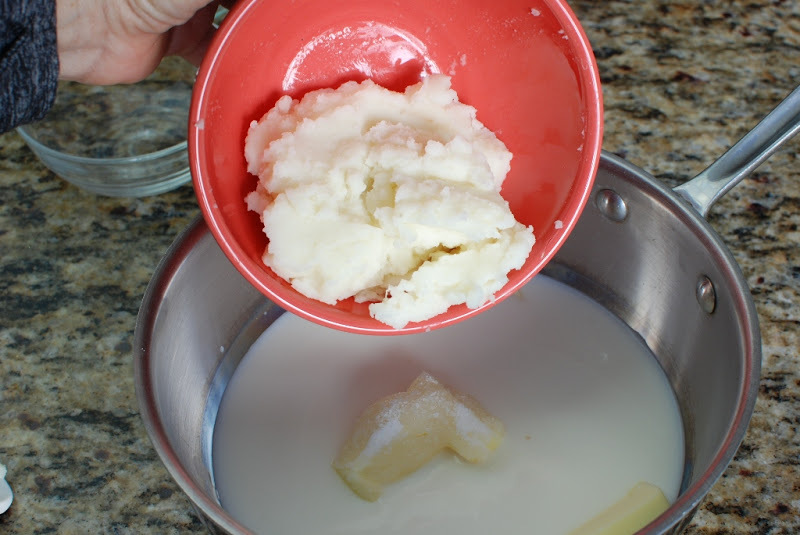 ***HINT: I found that I needed to double the batch for the vanilla glaze. I just always seem to run out. 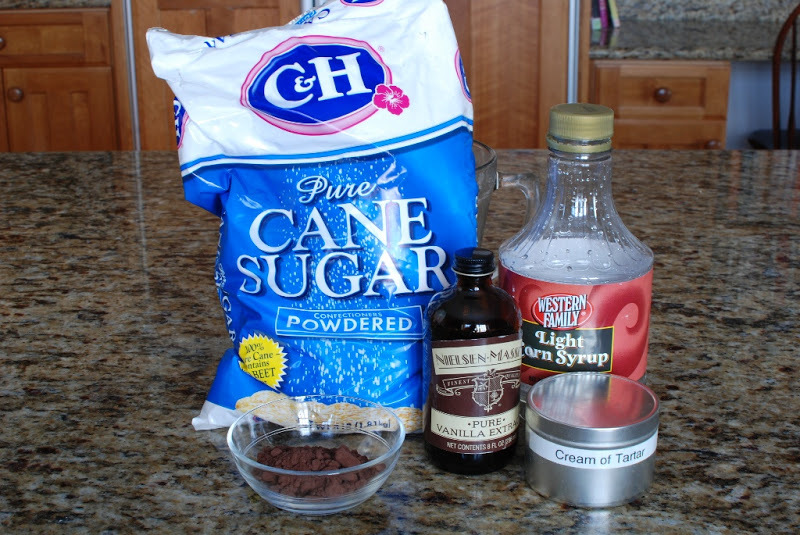 The chocolate glaze is the same except the the addition of cocoa powder. 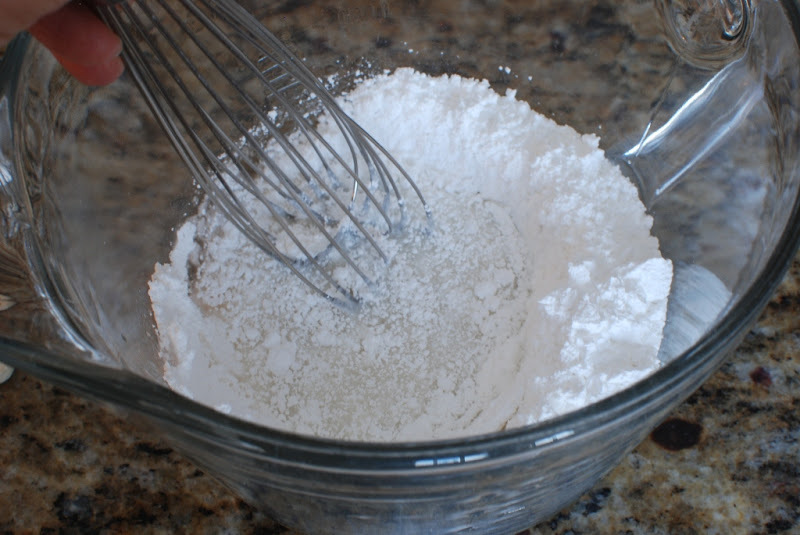 In a mixing bowl add cream of tartar to the confectioners sugar. 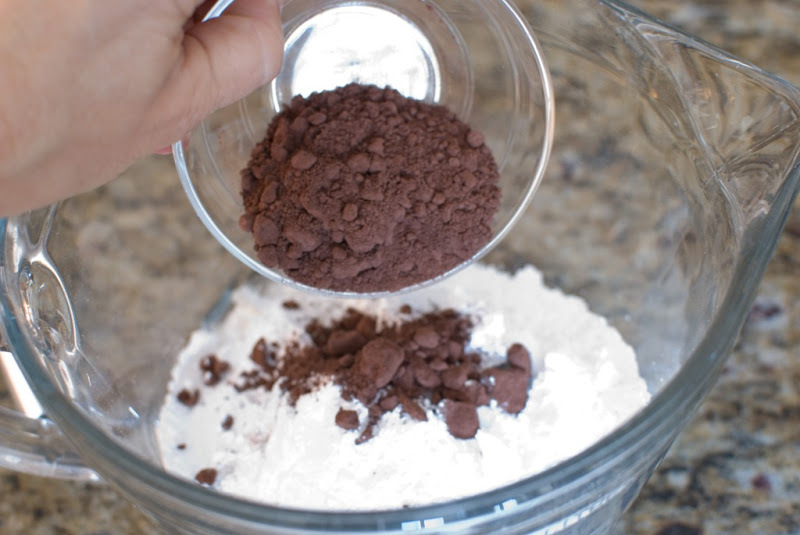 Add 2 – 3 tablespoons cocoa powder. Of course I used 3 tablespoons. 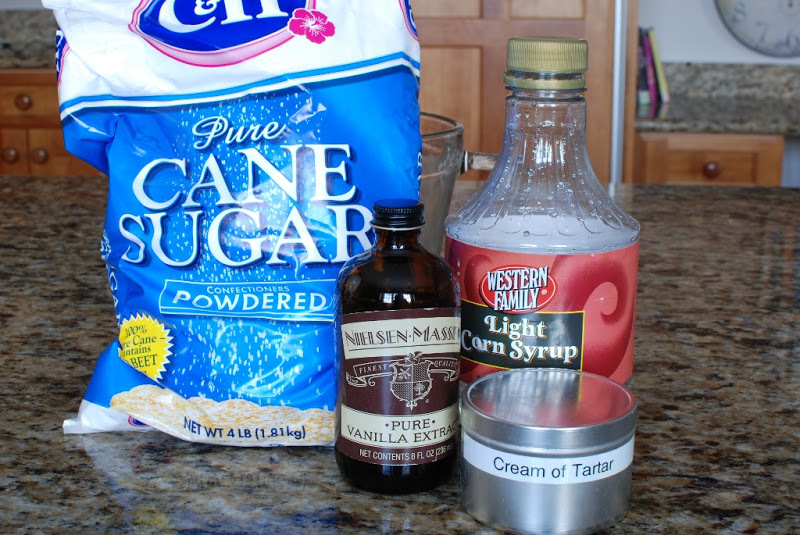 Add 1 tablespoon corn syrup. The chocolate glaze requires more vanilla. 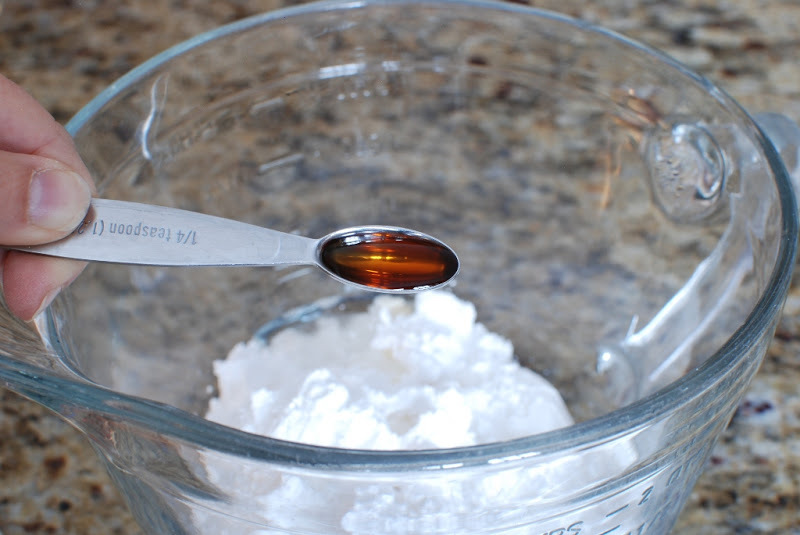 Add 1 teaspoon vanilla. The doughnuts and the doughnut holes should be raised and double in size by now. You will need a big heavy pot with about 3-inches of oil in the bottom. Let’s talk oil. I asked a friend who has worked in a doughnut shop what type of oil she used for frying up the doughnuts. She told me they used peanut oil. I purchased some peanut oil and it was quite expensive. Their must be varying flavors of peanut oil. The oil I purchased was lovely buy I didn’t like the flavor on my doughnuts. I did like how nicely the doughnuts browned in the peanut oil. After frying up a few I decided to switch back to Canola oil that I have always used. If anyone out there is an expert on oils, I’d love to hear from you. Where is the best place to purchase a lightly flavored peanut oil. You can used what ever oil you prefer. 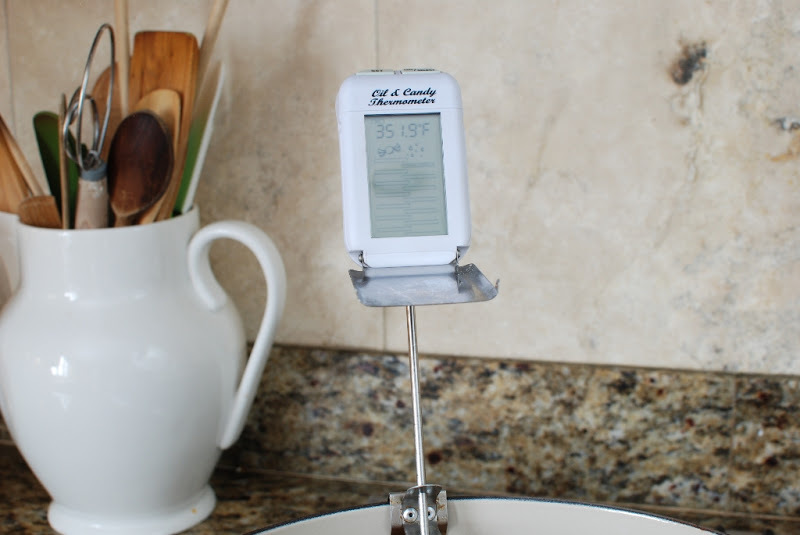 I find that keeping the oil temperature between 355 and 360 degrees was just perfect. The doughnuts didn’t brown too much and they were not doughy inside. I hope you have a candy/oil thermometer of some kind. It is most handy to have. I can’t live without mine. I purchased mine from Williams-Sonoma. The digital one like the one pictured is $35. I know that’s pretty pricey, but mine is well used. Especially at Christmas time when making candy. 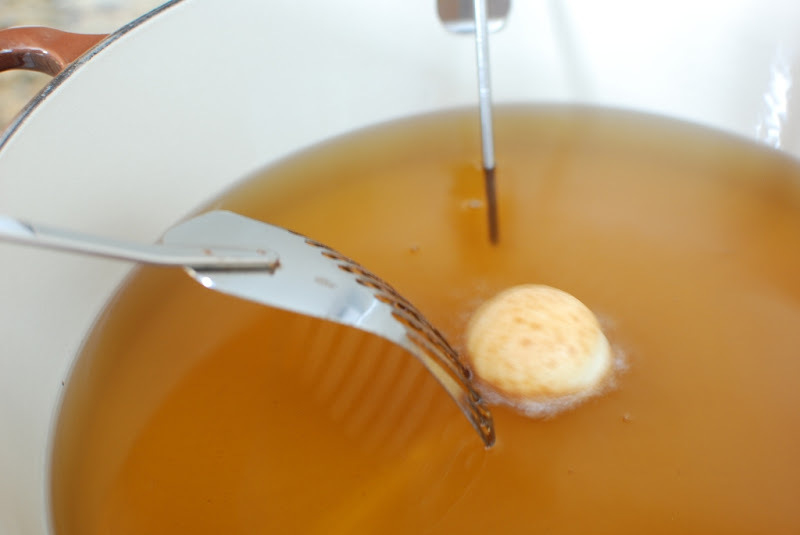 I like to drop one of the doughnut holes into the hot oil to see if it’s up to temperature. 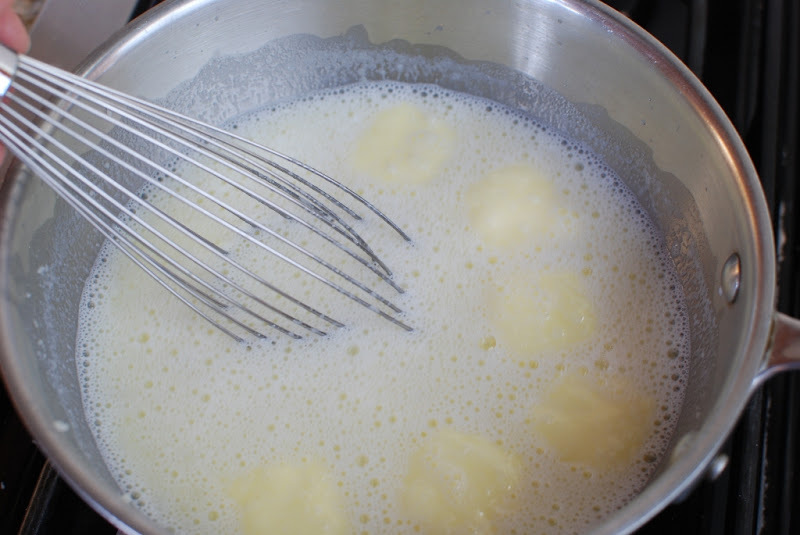 If it immediately begins to bubble and sizzle around the edges the dough is hot enough. 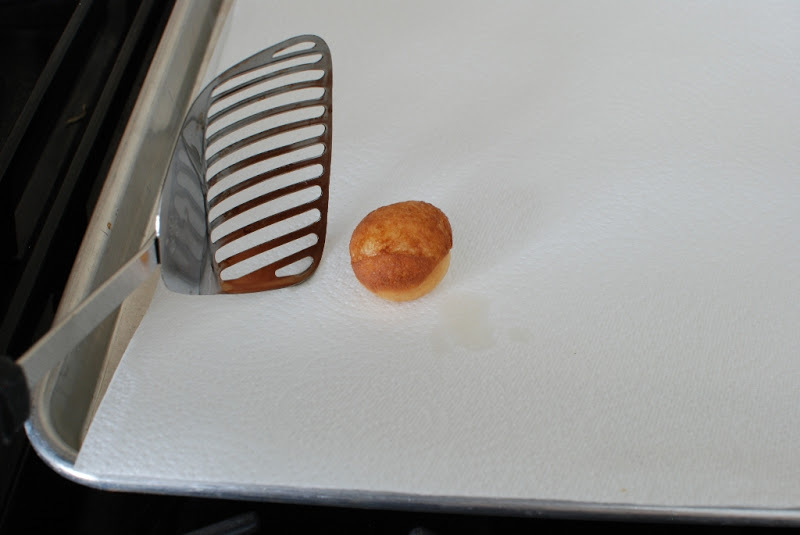 Doughnut holes are hard to cook because the become a bit bottom heavy and don’t like to turn over. Just keep moving them around until they are golden brown. I like to have a baking sheet lined with paper towels next to the pot. 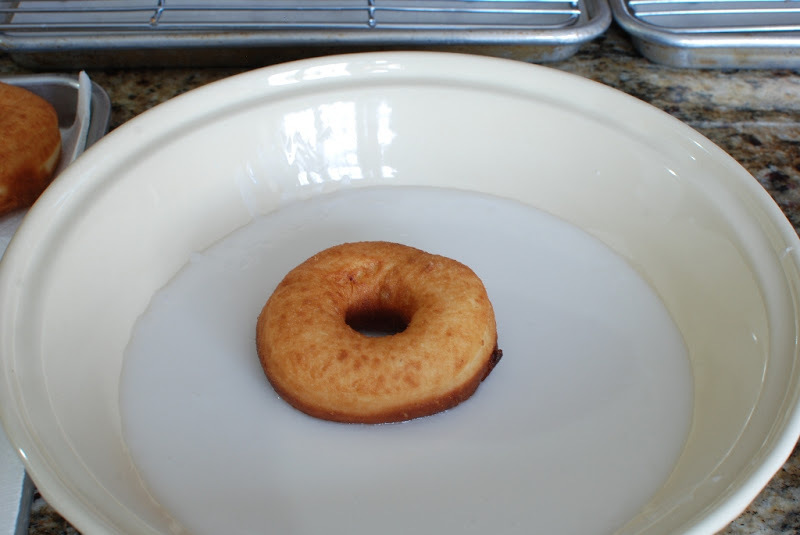 Remove the doughnut hole from the oil and place on the paper towels to absorb extra oil. 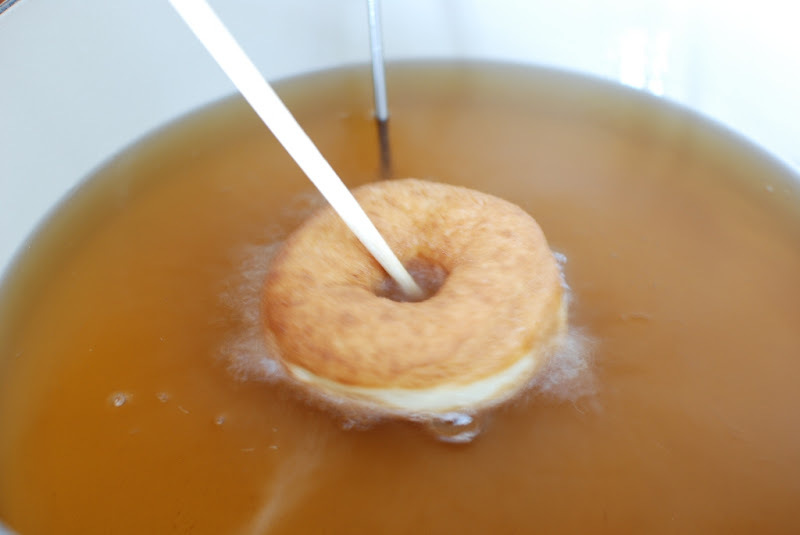 Now that the oil is hot enough, start frying the doughnuts. I start with just one doughnut. Just to ensure the oil is just right. I have, also, found the best tool for doughnut making is a chop stick. See how handy the chopstick is. Once I get the hang of the frying, I will just fry up 4 doughnuts at a time. Then glaze them. Then fry up 4 more, glaze, repeat. 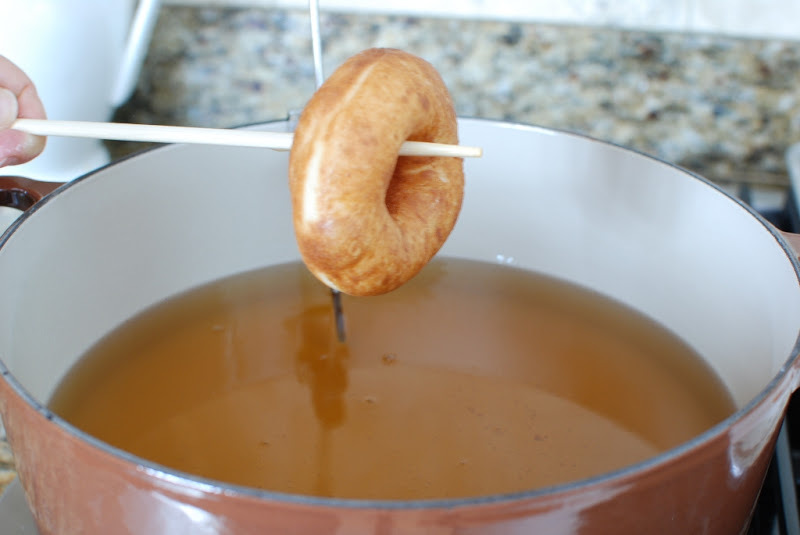 While the doughnut is still hot dip in the glaze that you have already prepared. 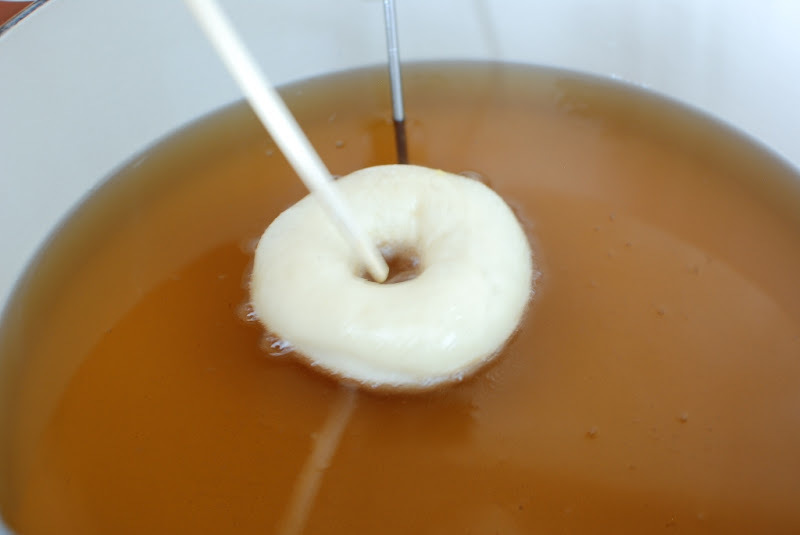 Completely coat the entire doughnut in vanilla glaze. Allow a little extra glaze to drip off. 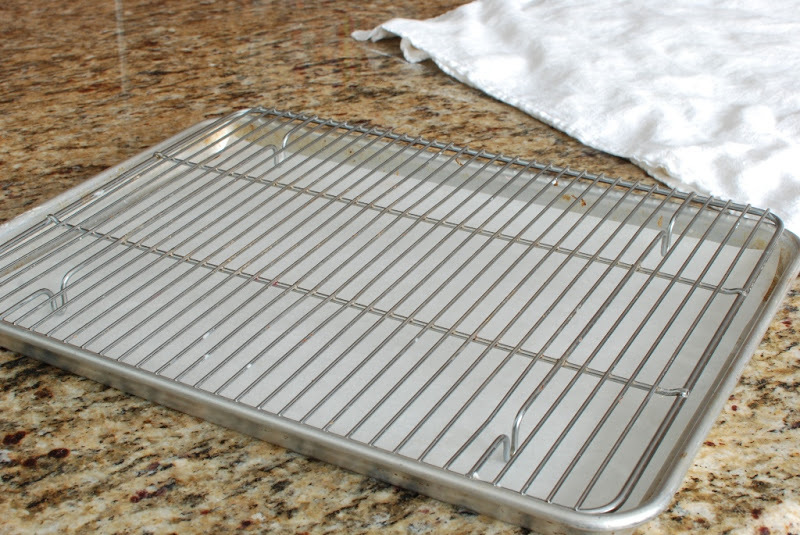 I forgot to mention that I always have a baking sheet with a wire rack ready to place the glazed doughnuts on . I have an assortment of sprinkles ready. 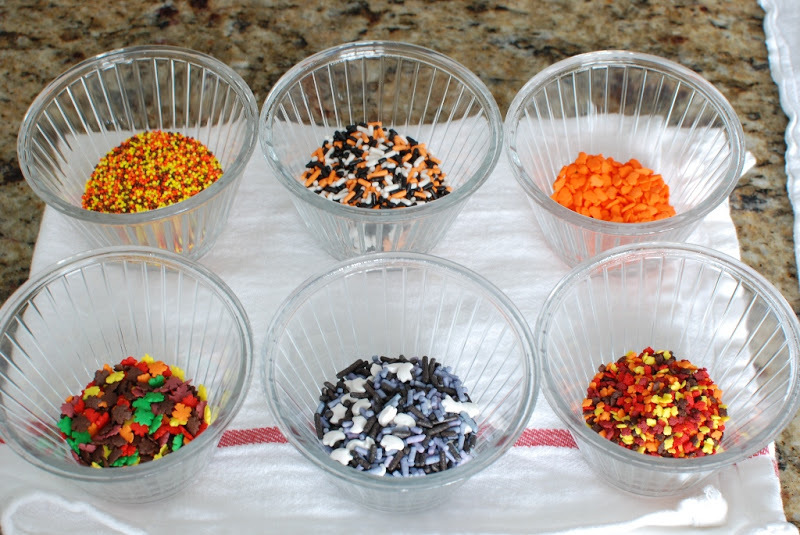 I’m using an assortment of fall and Halloween sprinkles. Thank you King Arthur flour. Promise me you will eat at least one while it is still hot and gooey. 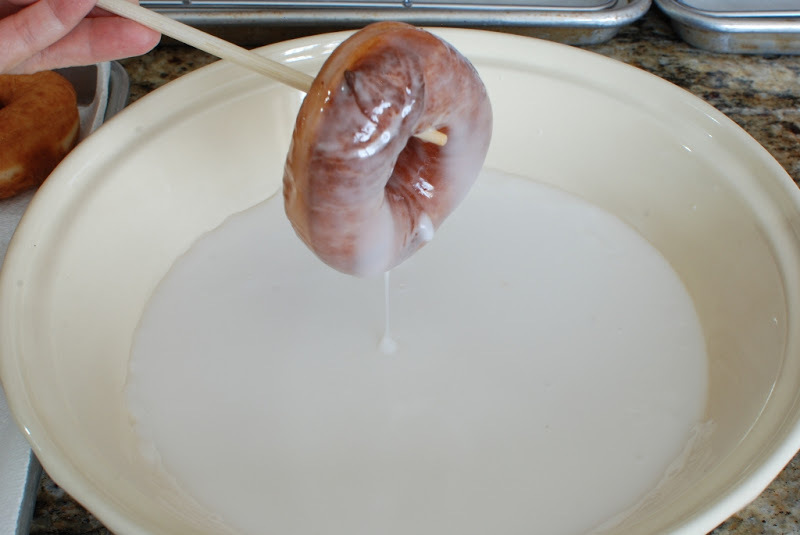 Only glaze the top of a chocolate glazed doughnut. 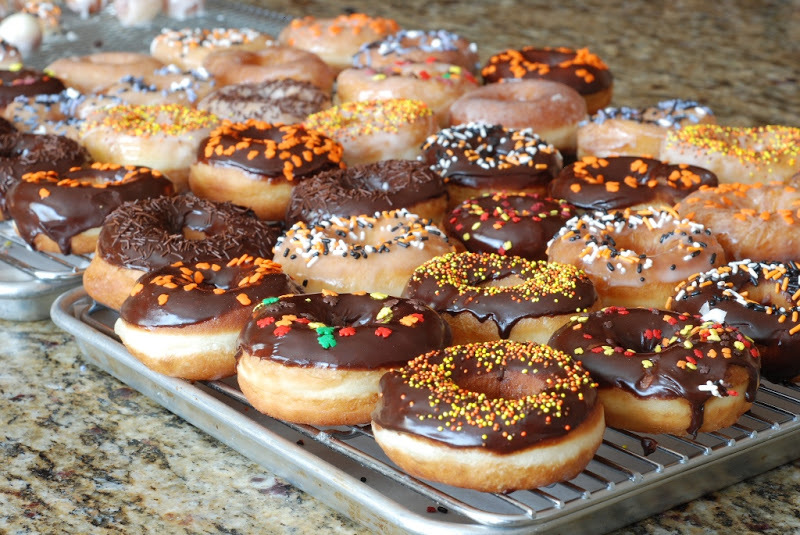 I allow the doughnuts to set on the wire rack for about an hour. The glaze will set up nicely. In the meantime, I generally sample a dozen doughnut holes or so. The final assortment of glazed and chocolate glazed doughnuts. 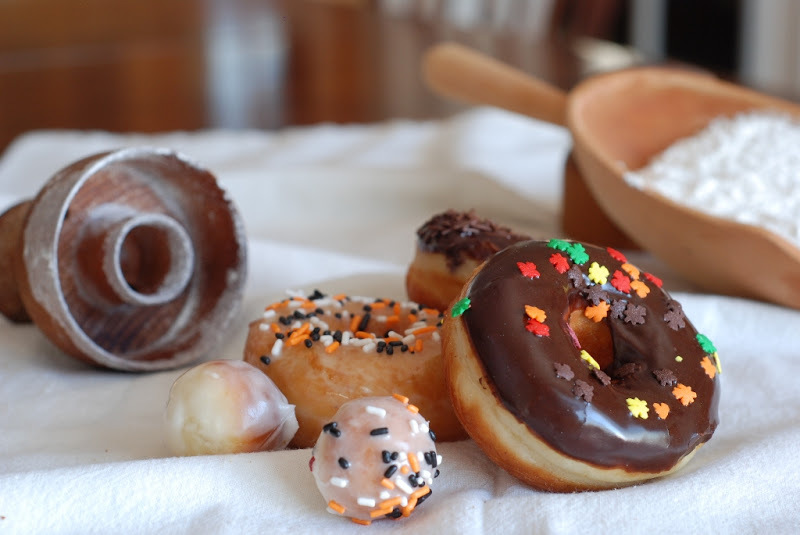 Doughnut, donut, spudnut…whatever you call them or however you spell them, the are so much more fun to make when you have someone to share the experience with. Next time I will invite the grandkids over to help with glazing, sprinkling and eating. Raised potato donuts or Spudnuts are soft and airy donuts made by adding mashed potatoes, which makes a soft and tender dough. 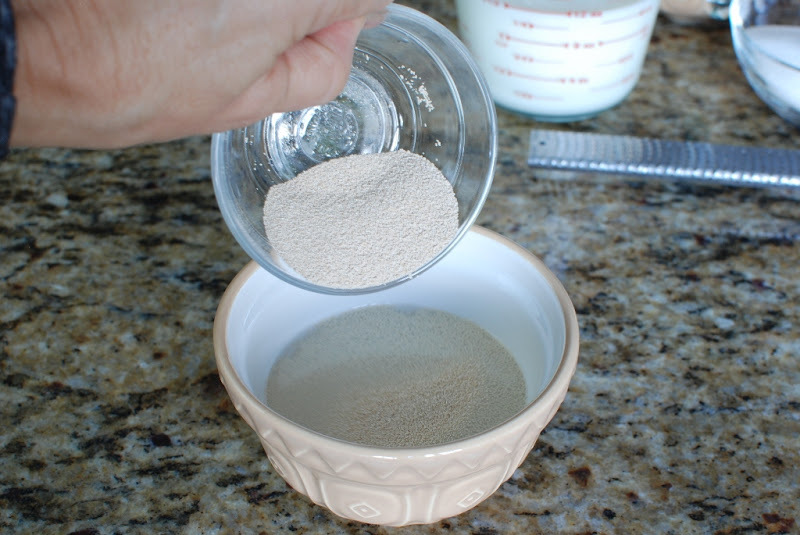 Dissolve yeast is the 1/2 cup warm water. 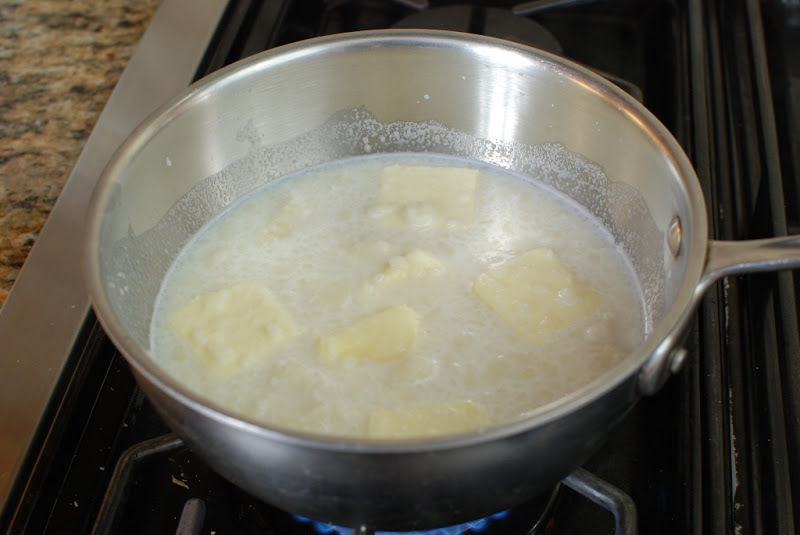 In a medium sauce pan combine milk, shortening, salt, sugar, mashed potatoes and heat to lukewarm. Set aside. 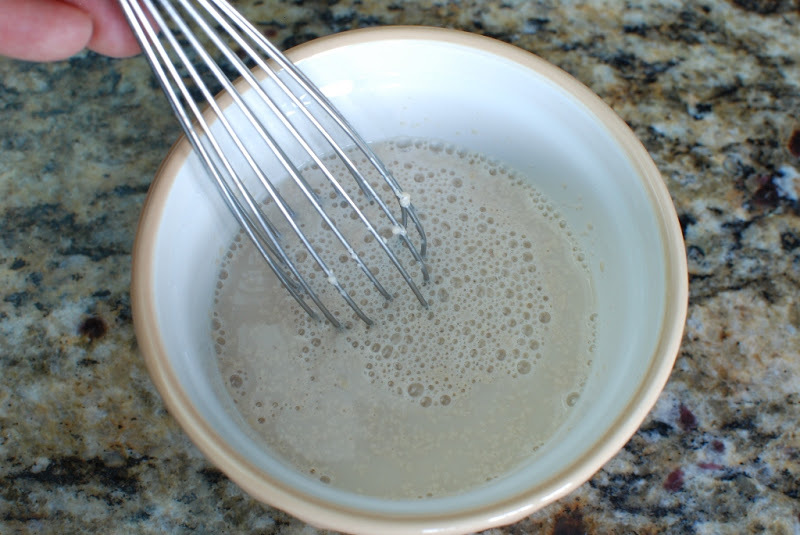 Pour into the bowl of an electric mixer and add beaten eggs and dissolved yeast. 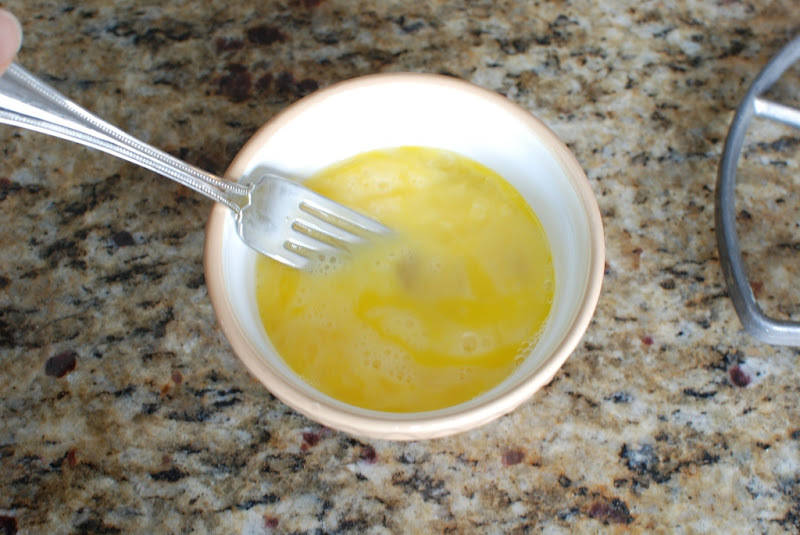 Add the lemon juice, lemon zest and nutmeg. 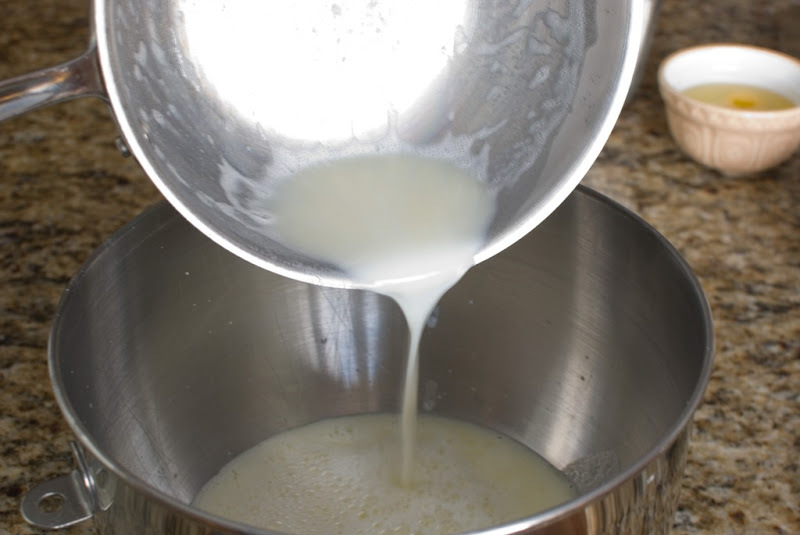 Add 3 cups flour and beat until smooth. 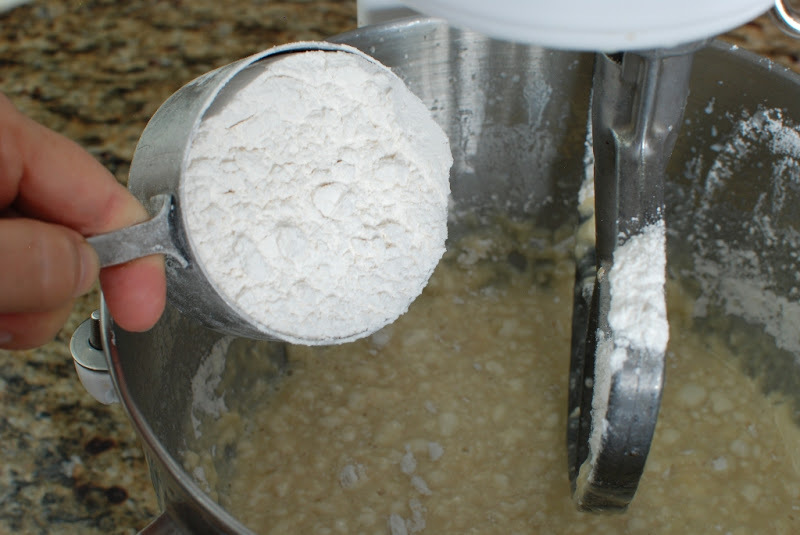 Add remain flour 1 cup at a time to make a soft but firm dough. Cover and let rise until double in bulk. 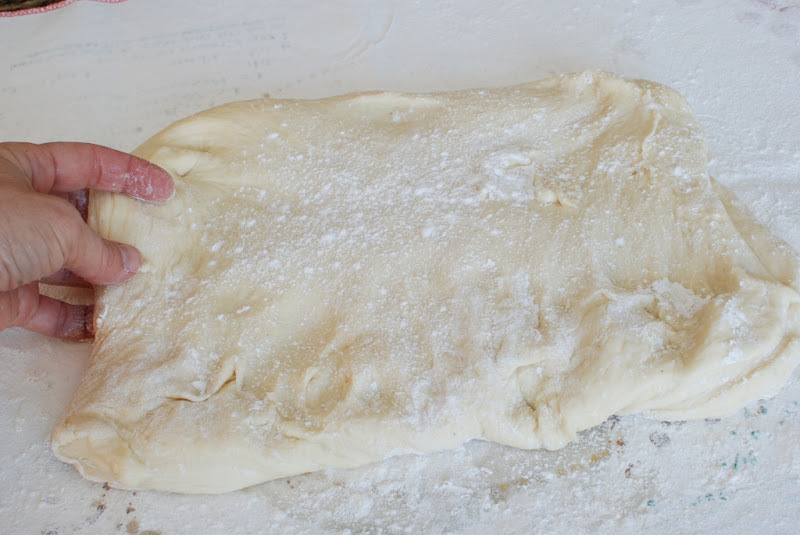 Punch down the dough and divide in half. 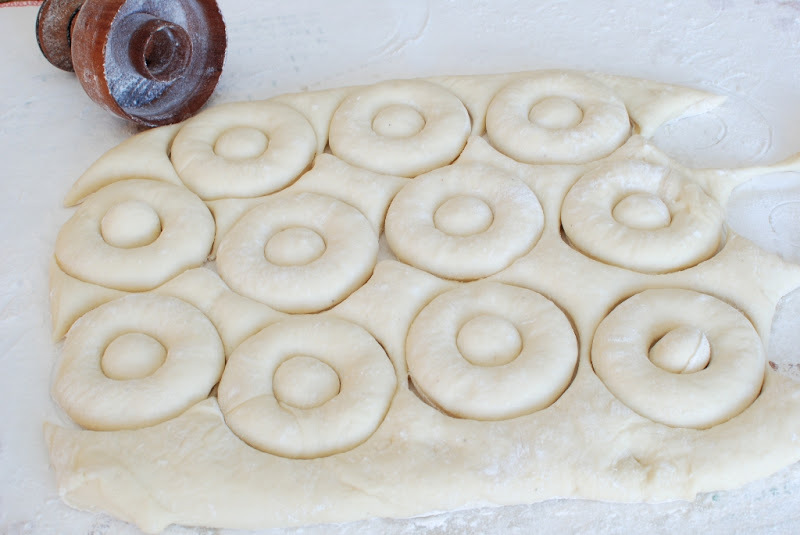 Roll out 1/2-inch thick and cut with a doughnut cutter. 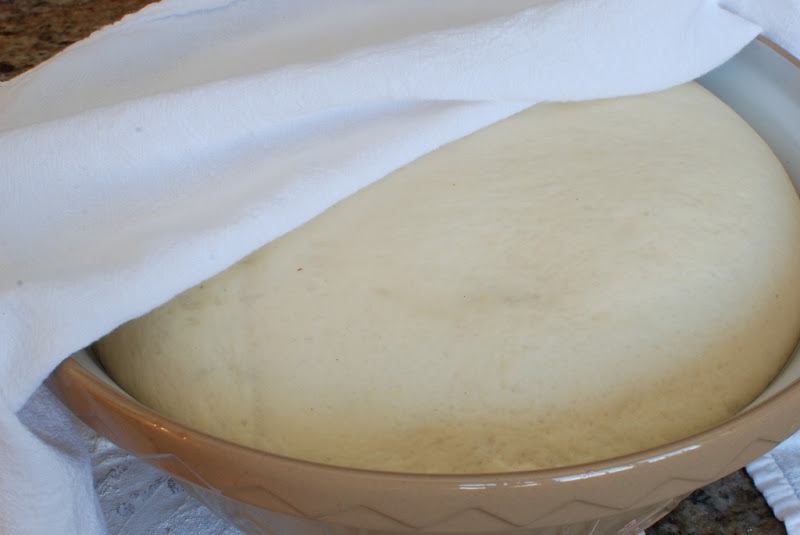 Cover with a cloth and let rise until double for about 30-40 minutes. 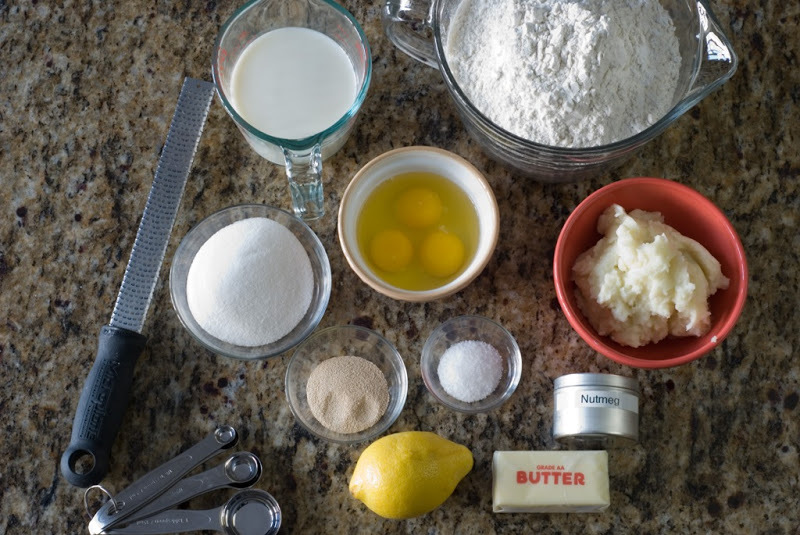 Mix all ingredients until smooth. 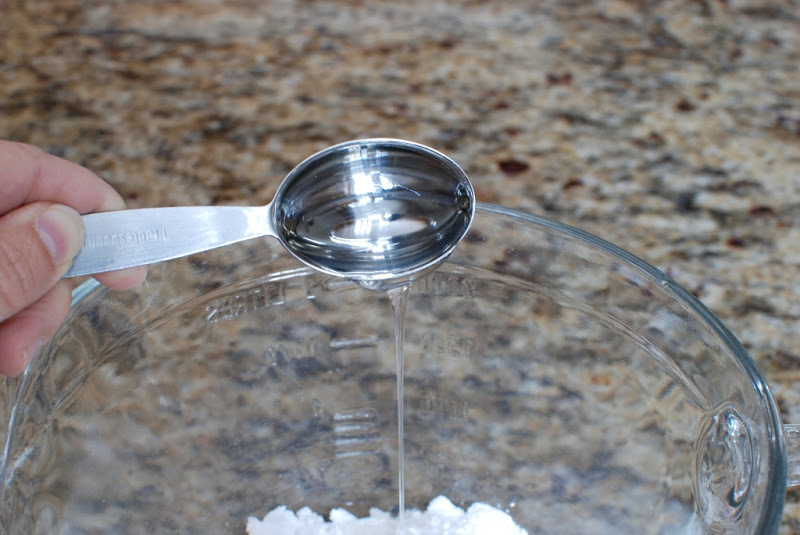 Add more water 1 tablespoon at a time until a thin consistency. Mix all ingredients until smooth. 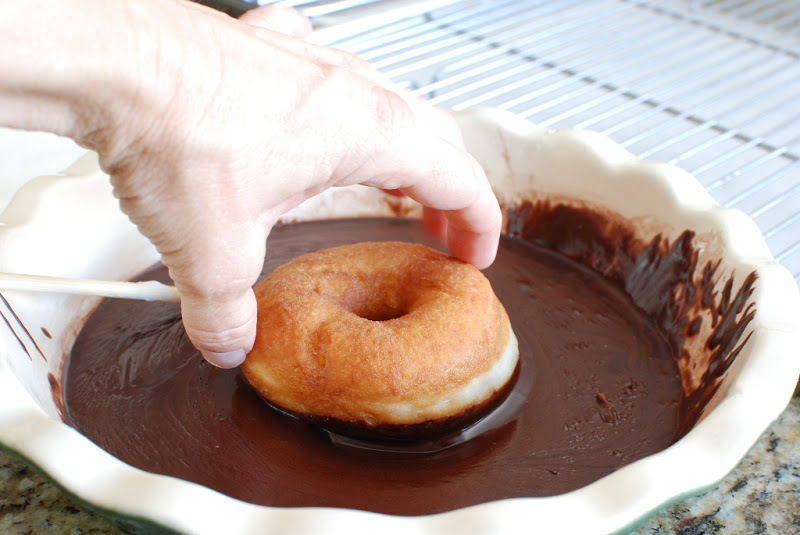 Chocolate glaze will be thicker than the vanilla glaze. I always double the glaze recipes because I always run out of glaze. Please note that the nutritional facts DO NOT include the glaze or the deep frying. 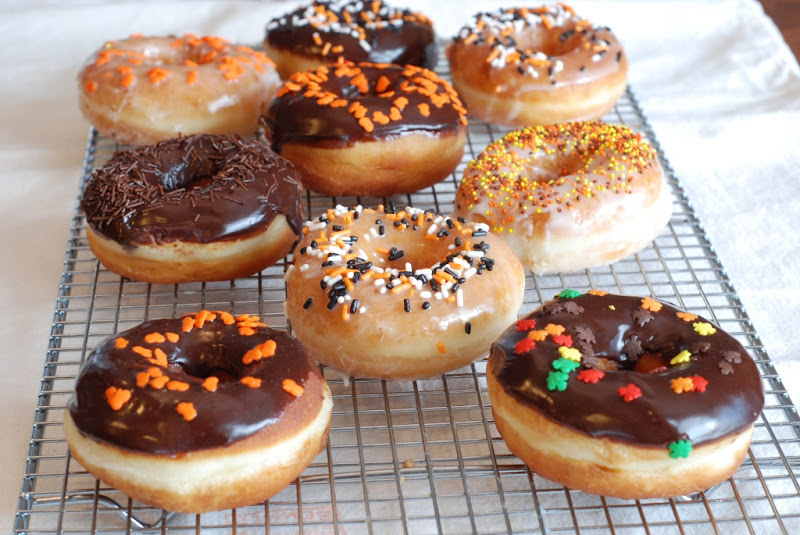 Amount of donuts may vary, depending on how thick dough is rolled out and how many donuts holes are made. Thank you Carol for your comment. Best family business ever! 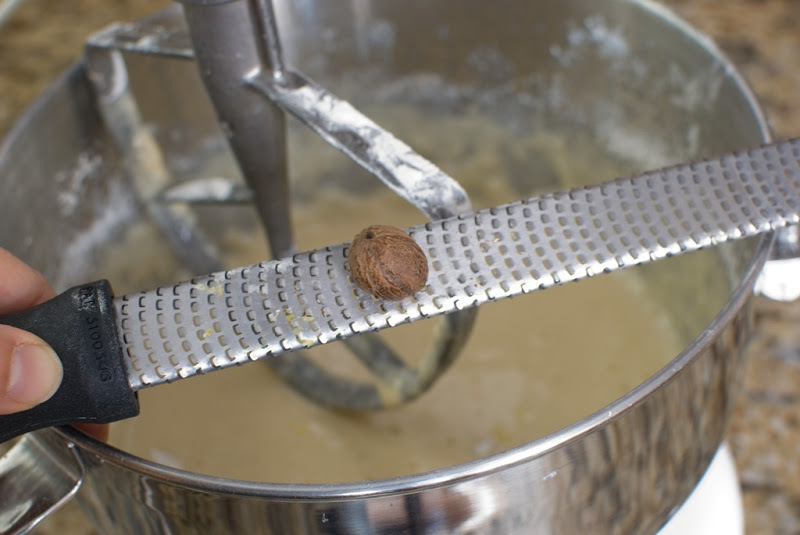 I hope you have the family recipes for the Spudnuts made in your shop. What a treasure. Love this recipe. My family actually had a Spudnut Shop when I was in junior high school. Best donuts you will ever have, and I believe the franchise was started in Utah. Thanks for the recipe. I grew up in a small town in Texas that had a Spudnut shop. I have longed for a recipe every since. Is this like the commercial ones? Yes they are just like donut shop donuts. You will be amazed how delicious they are. I made these spudnuts today, and they were fantastic! I scaled down the recipe, as I didn't need 40 spudnuts. Thanks for this recipe and the great instructions. Had heard stories from my mother and older siblings about spudnuts. I decided to try my hand today. Thank you for the very clear instructions and delicious recipe. Entire family loved them. I will definitely keep making these lovely little gems. Thank you for your kind comments. I'm so happy your family approved. I made these this weekend and they were a loved by all! Thank you so much, I am so glad you are back. I missed your Christmas chocolates post this past year. Welcome back!!!! Thank you so much. I really missed doing my Christmas post. I'll get it together for next year. Great pics, clear instructions and very good tips! "used" oil and starch maybe? 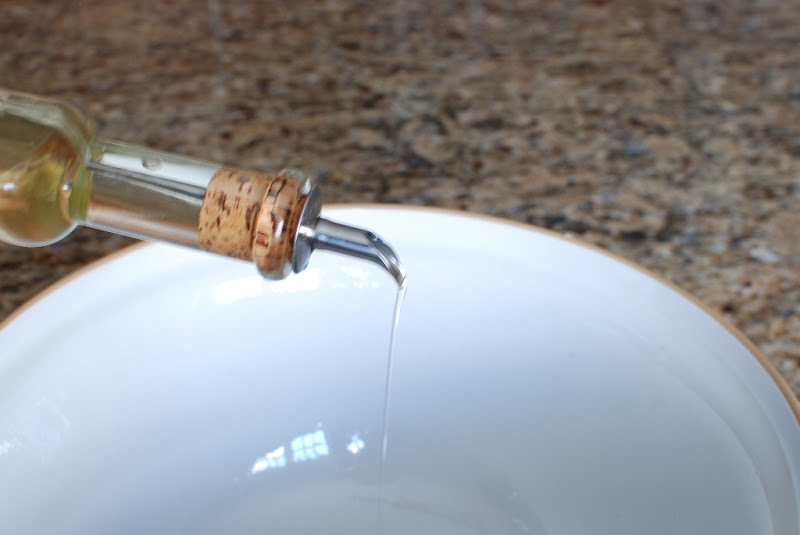 Keeps the oil from soaking into the dough before it cooks. Fabulous tip! Thank you so much. I will definitely try it. Thank you, thank you, thank you I have been looking for recipe for a while, your pictures are gorgeous (am a visual learner) and you explain everything so well. am eating a donut in Sicily, Italy and remembering the donuts my mom used to make and when she passed away I lost the recipe, this is it!! thank you so much! jealous? why? btw my husband and in-laws loved the spudnuts! You're in Italy! It's a dream of mine to say that I'm eating a donut in Sicily. 🙂 I'm so happy the spudnuts were a hit. So excited to make these but I must've done something wrong… the dough doesn't seem to have risen at all and it's been 1hr 55min. Should I proceed with the recipe or any ideas what I might have done wrong? Your dough should be ready within an hour or so. Was your yeast fresh? Let me know if the dough ever raised enough. I hope it did. I am so making these! Halloween has been pushed to Monday in my area because of Hurricane Sandy, so I have the weekend to prepare. Thank you for sharing!! I'm sorry you had to deal with Sandy, but happy you have an extra few days to prepare. Good luck. Thank you so much for this fabulous post! In Richland, WA (I'm from the area known as the Tri-Cities), we still have a spudnuts shop. But I can't tell you how excited I am to have this recipe so that no matter where I move, I can continue to have my spudnuts! Thanks again! I used to live above a Spudnut Shop. Torture! I don't know if there are any left, but I'm so happy to have the recipe! Thank you! Hats off your all hard work! You put all step-by-step pics for our convenience that really appreciable! The end result is really mouth watering. The pie plate I used was called "Pure" by Chantal. I love the neutral color. Thanks for you comments. I'm just bit confuse, which doesn't take much. I made the glaze in a glass anchor hocking 8-cup measuring cup/bowl. The stainless steal pan that I used to mix the milk mixture is All-Clad. Did I answer correctly??? Please share your success once you try. thank you so much for your comment. Those look scrumptious!! And not too horrible difficult. I may have to try this one!! All it takes is a little extra time in the kitchen. Thanks for stopping by.